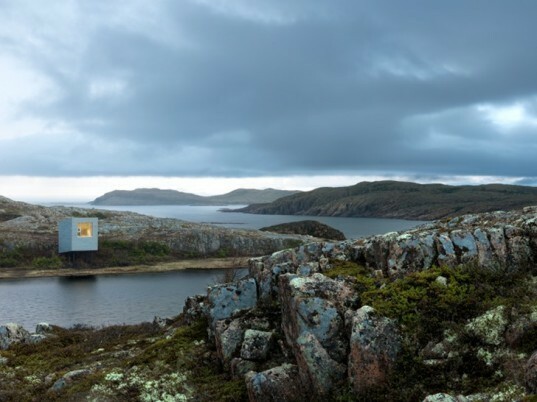 Bridge Studio is one of six minuscule artist studios designed by Saunders Architecture commissioned by the Shorefast Foundation and the Fogo Island Arts Corporation. 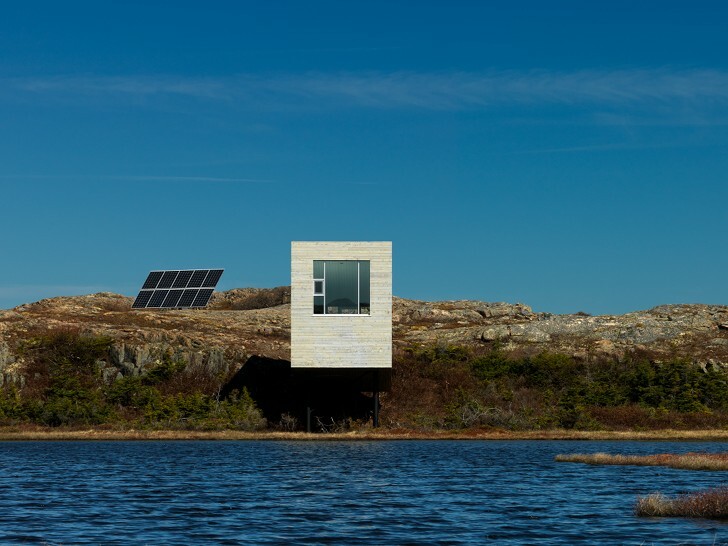 This micro studio is isolated on the coast of Fogo Island, Canada and dramatically situated on a steep hillside overlooking the calm waters of an inland pond. Because of its remote location, the shack relies completely on solar power and a wood-burning stove for energy and heat. Todd Saunders was commissioned to design a series of six artists’ studios at various Fogo Island locations. The goal of the Shorefast Foundation and the Fogo Island Arts Corporation is to preserve the islanders’ traditions and rejuvenate the island through arts and culture. These art studios will help draw attention to the island, preserve its beauty and provide space for artists in residence to dream and create new works. Bridge Studio is one of four studios that have been completed already. Located in Deep Bay on an inland pond and surrounded by low hills and craggy rocks, Bridge Studio is remote and isolated. The building’s form took inspiration from the Newfoundland fishing stage, or traditional fishing shacks that were used in conjunction with cod fishing. Set upon a piling foundation, a bridge is necessary to access the studio, which is set above the water. The roof slopes upwards and culminates in a picture window to take in the view. Natural daylight streams in from both sides and a writing desk next to the window is perfectly situated for contemplation. A pole-mounted solar system set back from the studio generates power for the off-grid structure. A wood-fired stove inside the 320 sq ft (130 sm) studio provides additional heat. The studio was completed in 2011. See our coverage of Todd Saunders other artist studios on Fogo Island: Tower Studio, Long Studio, and Squish Studio. Le plus bel atelier de résidence d'artiste du monde. Todd Saunders was commissioned to design a series of six artists’ studios on various Fogo Island locations. The goal of the Shorefast Foundation and the Fogo Island Arts Corporation is to preserve the Islanders’ traditions and rejuvenate the island through the arts and culture. These art studios then will help draw attention to the island, preserve its beauty and provide space for artists in residence to dream and create new works. Bridge Studio is one of four studios that have been completed already. Located in Deep Bay on an inland pond and surrounded by low hills and craggy rocks, Bridge Studio is remote and isolated. The building's form took inspiration from the Newfoundland fishing stage, or traditional fishing shacks that were used in conjunction with cod fishing. Set upon a piling foundation, a bridge is necessary to access the studio, which is set above the water. The roof slopes upwards and culminates in a picture window to take in the view. Natural daylight streams in from both sides and a writing desk next to the window is perfectly situated for contemplation. A pole-mounted solar system set back from the studio generates power for the off-grid structure. A wood-fired stove inside the 320 sq ft (130 sm) studio provides additional heat. The studio was completed in 2011. The entrance and interior of Bridge Studio. Location of the Fogo Island Artists Studios.